Plenty of destinations exist around the country for riding ATVs and if you have the travel bug you just might develop a bucket list of places to ride. Classic MX parks, the dunes or off-road adventures await but you have to get there first. Hauling an ATV doesn't come easy. You need a large pick-up truck or a trailer plus everything to keep your quad running. Accordingly, expect to make room for all the tools, spare parts and fluids. And, depending on your final destination forgetting a crucial component could very well mean the difference between a short riding trip and a thoroughly enjoyable expedition to a place unknown. Anytime you remember something, jot it down. Start the list now. Don't expect to remember in a few hours or the next day when you begin taking inventory. Keep the list handy so you can quickly make a note. 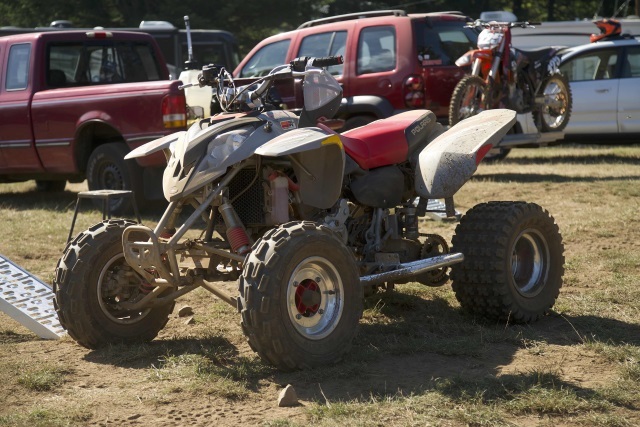 To help get you moving we developed a Pre-Ride Checklist for your ATV. 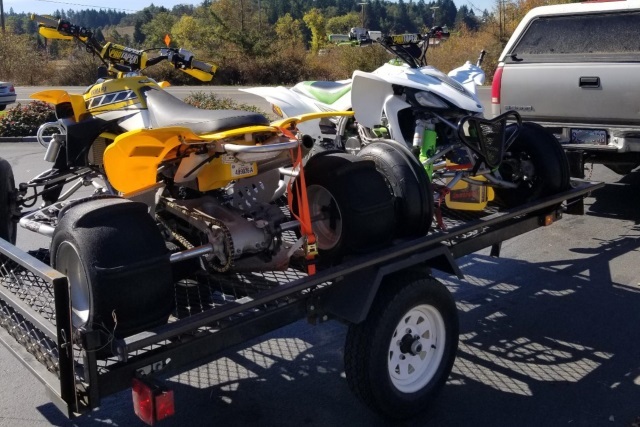 Your ATV won't tip over during transport but if not effectively tied down could result in damage to your quad or hauler. Use ropes, bungees and/or tie-downs to secure the ATV and put it in gear - this keeps them from rolling. Engage the parking brake if you have not removed it. Turn the fuel off and don't add any more gas until ready to ride. 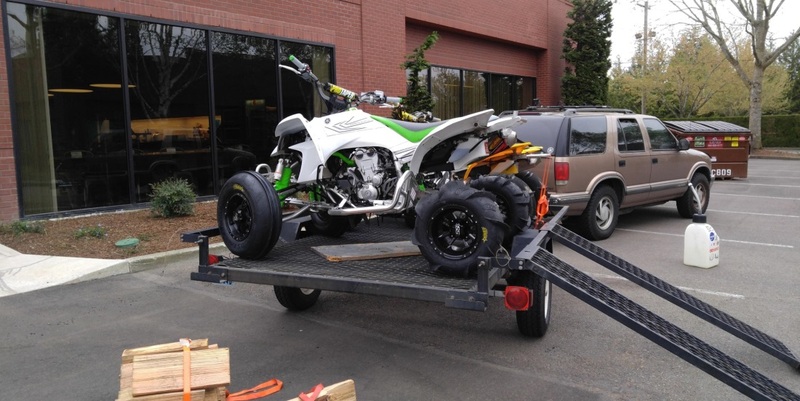 Check out "How To Load a Motorcycle, Dirt Bike or ATV Into a Truck" for more help. A long road trip means stopping for gas, restrooms brakes and something to eat thus possibly leaving your ATV unattended in the back of your truck or trailer. If you have a travel companion take turns doing your business inside. If alone, keep an eye on your ride as much as possible. Use a large security cable or lock to deter thieves. If someone wants your ATV it takes mere minutes - about as long as it takes for a quick bathroom visit - but with visible security features you can prevent someone from getting a free ride at your expense. A long road trip could also require a sleepover at a hotel along the way. Take this opportunity to find a higher end hotel in a good part of town. Unlike a dirt bike that fits through a hotel room door, your ATV must stay outside. This sets up the scene nicely for thieves. A Toy Hauler or enclosed trailer pretty much eliminates the possibility of theft since no one knows you have an ATV inside and most thieves don't snoop around without easy access for something they want. Of course, if you don't have an enclosed hauler you need to thoroughly secure your ATV with a cable. Don't rely on removing the key as your sole precaution. You can bypass an ATV ignition pretty easily. String the cable through the frame or anything else that doesn't remove - NOT through the a-arms. Remove anything of value that easily detaches, like the seat, and take with you. You can also unplug the CDI or remove spark plug wires as a diversion. Take your gas cans inside too. Park your trailer near your room or even the front entrance of the hotel for more visibility. Find anyway to make stealing your quad inconvenient and time consuming to deter potential thieves. Once you have arrived at your destination do the usual pre-ride prep work like topping off with fuel, checking tire pressure and any other adjustments to your handlebars and suspension that the road trip might have affected. You will hit some bumps along the way, figuratively and literally, but that's part of the adventure and you will learn to live without - this time. Next time, expect to remember whatever you forgot last time and write it down first. Do I Need a Big Bore Kit?